Stages in Seed are usually tied to a Git branch. You can read more about adding a stage here. Seed can also automatically create stages when a new Git branch is created. 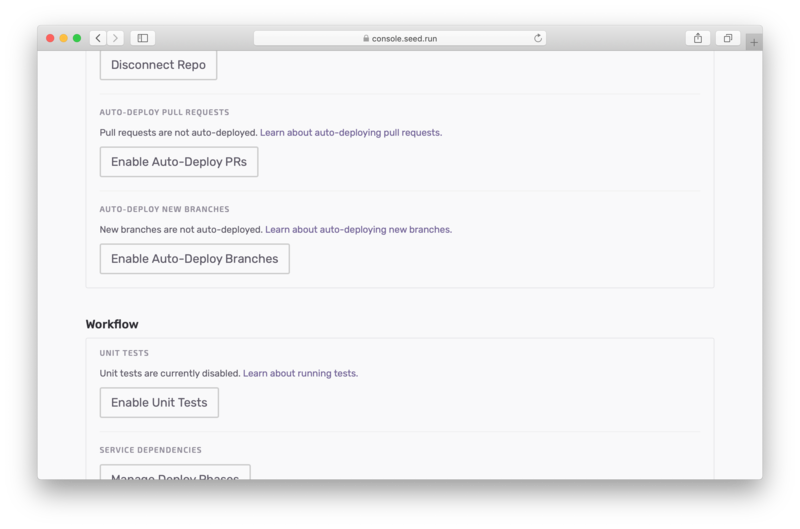 We currently support automatic branch deployments only for GitHub. Contact us if you’d like to use it for Bitbucket or GitLab. Head over to your app, click Settings and hit Enable Auto-Deploy Branches. Here you can specify a stage to inherit the environment variables and other settings from. For example, your dev stage might be configured with environment variables for your app and with a set of IAM credentials specific for dev deployments. By selecting the dev stage, any stage that is automatically created for a new branch will inherit the settings from the dev stage. You can also specify what you want to do once the branch is closed. By hitting the Remove the stage and all the resources when the branch is deleted checkbox, you are telling Seed to remove the automatically deployed stage and all the resources. You can always manually remove these stages by following the steps in this chapter. Once you hit Enable Auto-Deploy, any new Git branches that are created will create a new stage in Seed automatically!